TTl Suppose that you're creating a formal narrative project status report or preparing a presenta tion for a high-profile project status meeting. 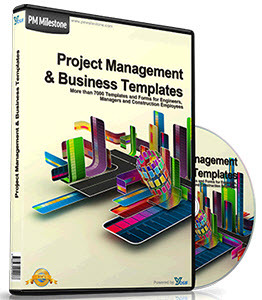 You can copy a view in Microsoft Project and paste it into a Microsoft Word document or a Microsoft PowerPoint presentation slide. Note To use the Copy Picture To Office Wizard, you must have Microsoft Word, Microsoft PowerPoint, or Microsoft Visio 2000 or later installed on your computer. 1 Click View, Toolbars, Analysis. 2 On the Analysis toolbar that appears, click Copy Picture To Office Wizard. Read the first page of the wizard and then click Next. 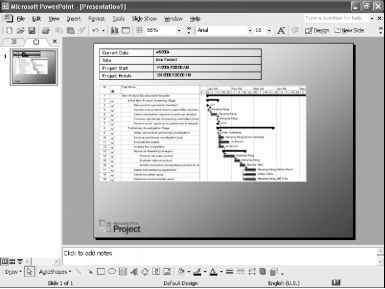 Select options on the second page of the wizard to reflect how you want the Project view to appear in the Office application (see Figure 12-4). These options will differ depending on the type of view. For example, a Gantt Chart will present options different from the Resource Graph. Figure 12-4. 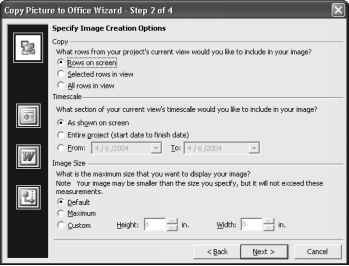 Specify options in the Copy Picture To Office Wizard to indicate how you want the picture of the Project view to appear. Click Next. Review the third page of the wizard, which you can use to preview the picture and then select the target Office application. A picture of the view is exported and saved according to the options you selected. A browser window appears, showing the generated picture. 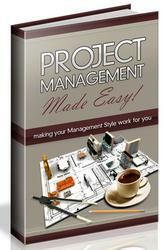 Return to Microsoft Project and the wizard. Under Application, click the program the picture is intended for. If necessary, select whether the picture should be presented in portrait or landscape orientation. Click Next. The option for any program not installed on your computer is dimmed. Select any Microsoft Project fields you want to export along with the picture of the view. The available fields are listed in the Microsoft Office Project Fields box. Click one or more fields (using Shift or Ctrl to select multiple fields) and then click Add. Click the Move buttons if necessary to rearrange the positions of selected fields listed in the Fields To Export box. Then click Finish. The picture of the Microsoft Project view with any selected fields is exported and saved to the selected Microsoft Office application. In the final window of the wizard, click Close. The selected Office application opens and displays the picture (see Figure 12-5). Figure 12-5. The selected Project View and fields appear in the Office application you selected. For more information about other methods of moving project data to different programs, see Chapter 16, "Exchanging Information with Other Applications."